Hello everypony!! Here is the Official Cutie Mark Vector of Pinkamina Diann Pie! Use to your hearts content! EVERYPONY LOVES BALLOONS!! Used in quite a few of my deviants. Can I Use It For A Flappy Bird Game? Because I'm Doing A Flappy Pinkie! It's likely traced from the show, as many vectors are. It's not that that's bad, but this isn't freehand. I like your cutie mark vector of Pinkie Pie. Just to let you know, I used it at: doctorbristle.tumblr.com/post/… It is for one of the Pinkie Pie blogs named "Pinks-and-Pies." I am posting this link because it is my responsibility to do that. used :3 and might use again. 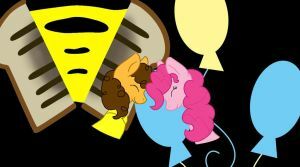 Also the other Cutie Marks of the Official Chacarters :3 Thanks for sharing them.